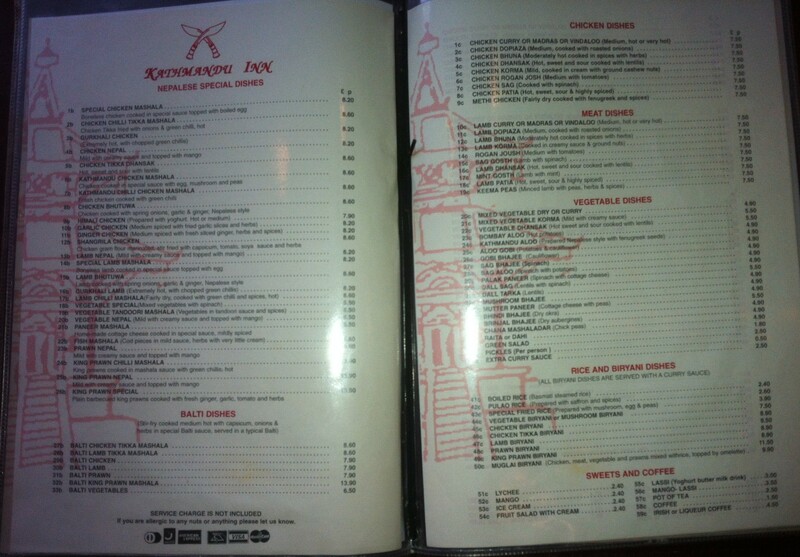 Kathmandu Inn | Restaurants of the World Unite! 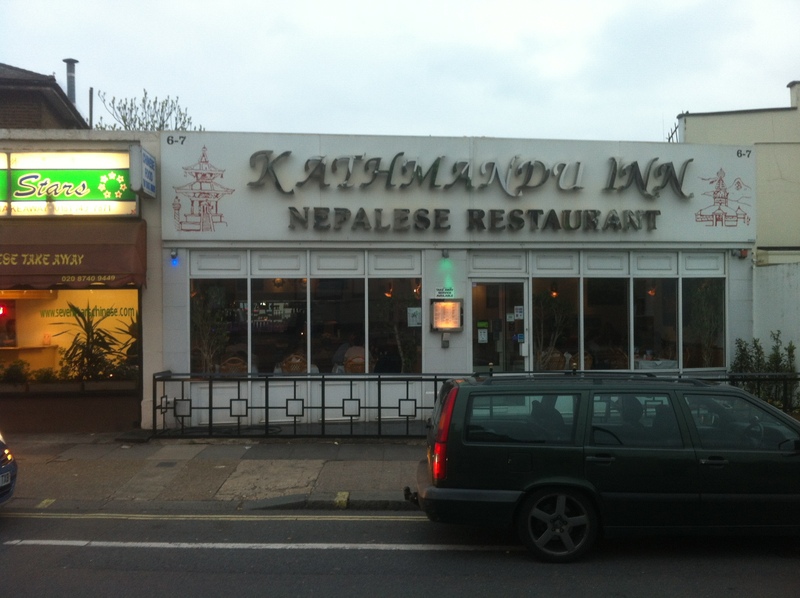 The complaint regarding Kathmandu Inn (http://www.kathmanduinn.co.uk/) is that it’s basically a curry house cloaked in the garb of a Nepalese restaurant. This is about 90% true. The menu is peppered with very familiar looking dishes and the only things which look Nepalese at first glance are the Gurkhali (Extremely hot, with chopped green chilis) or the Chicken Nepal (mild with creamy sauce topped with mango). For what I assume to be a mountainous country, mango doesn’t seem to a particularly native ingredient. Though I do get Tibet and Nepal mixed up. Which one did Tintin go to? Naturally, being the bearded alpha male I am, I would of course unhesitatingly go for the Gurkhali and probably ask them to spice it up a bit because I’m so gosh darn manly. But I like to share my dishes with Her Indoors who doesn’t like the spicy stuff, so I restrained my masculine impulse. Also: King Prawn Nepal? Nepal and/or Tibet are landlocked. Land prawns? Mountain shrimp? I don’t think so. The waiter was friendly to the point of unctuousness, and when quizzed directed us past the distractions and ushered us to the Bhutuwa. I opted for the lamb, Her Indoors for the chicken. 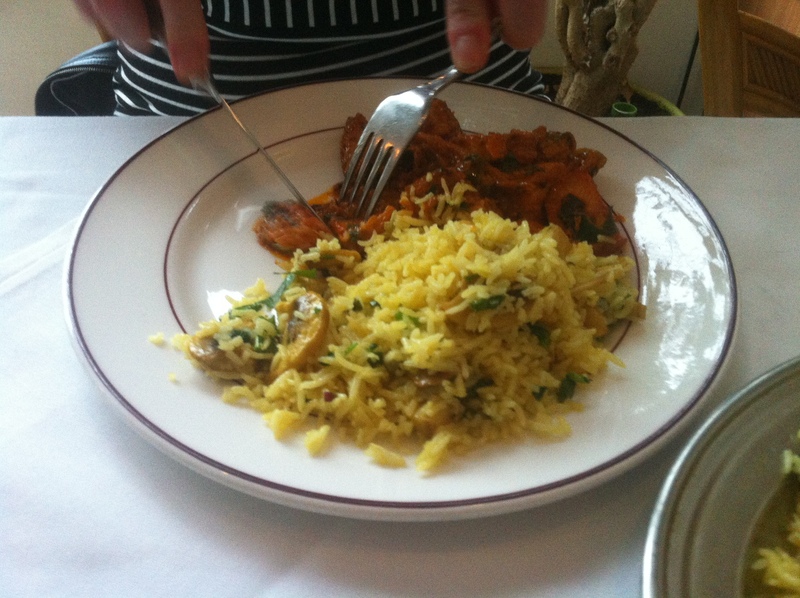 The chicken was somehow more flavoursome, but garnished with coriander, they were both delicious. 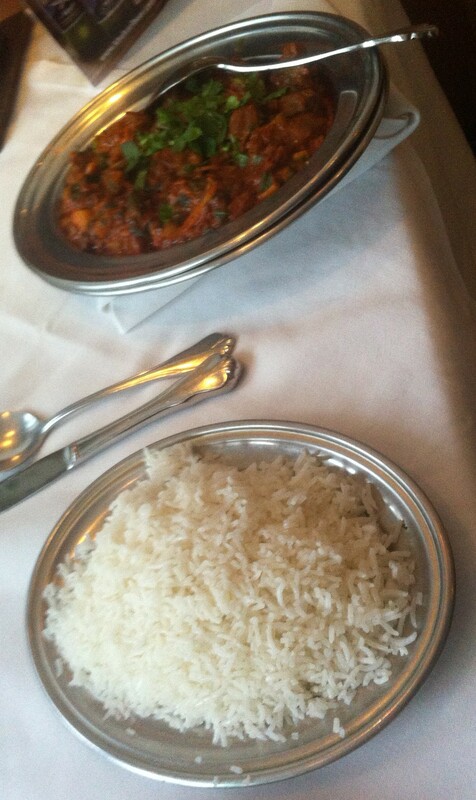 Her indoors insightfully pointed out that the inclusion of ginger in the dish elevated it from a standard issue curry. 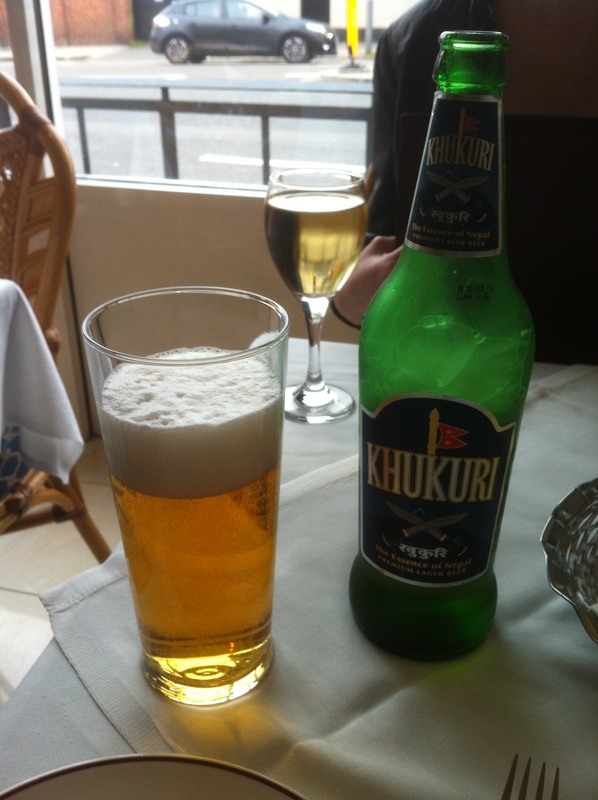 I washed mine down with a tall, cool Khukuri beer. The best was yet to come. 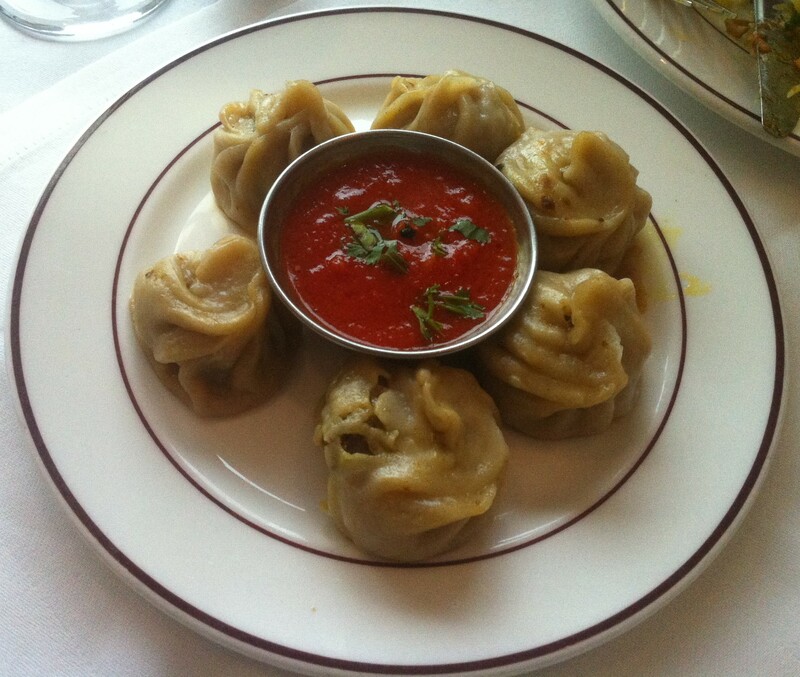 We also ordered the Momo – Nepalese meat dumplings – and were told they would take 15 minutes to arrive. The Momos looked an awful lot like dim sum, but the filling was of a much more Indian flavour. Indian meets Chinese in a little parcel of deliciousness (also my highly misleading personal ad). £37 for two including booze (another highly misleading personal ad). The Momos. With a tomato dipping sauce. Like how I’ve focused on the rice? That’s the important thing, not the exotic dish in the background. See what I mean? 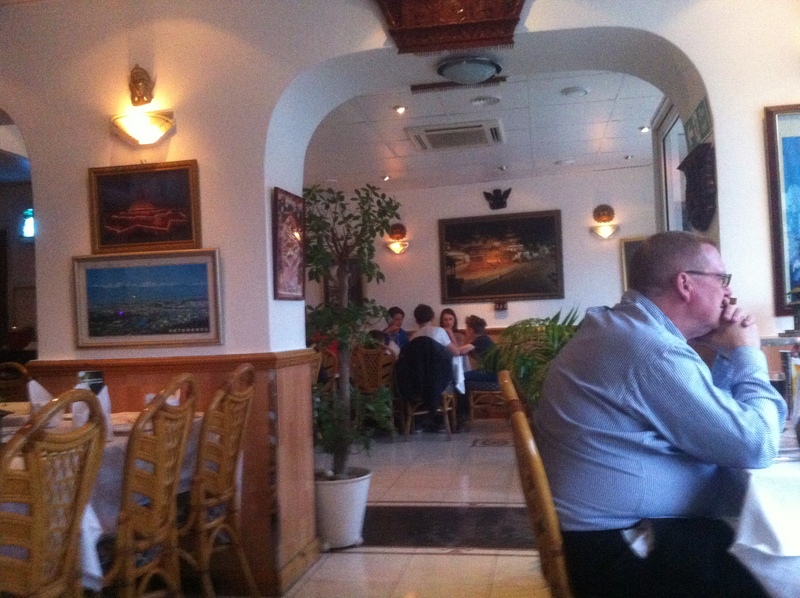 You could be in any curry house. I’ve offered my photographic services to estate agents, but no takers so far. We then ambled to Smith’s cocktail bar under the Brook Green Hotel (http://smithsw6.co.uk/) which I’m pleased to say is building up a loyal clientel having looked a little empty when first it opened. I can’t recommend the place enough for it’s many nooks and crannies and expert mixologists. 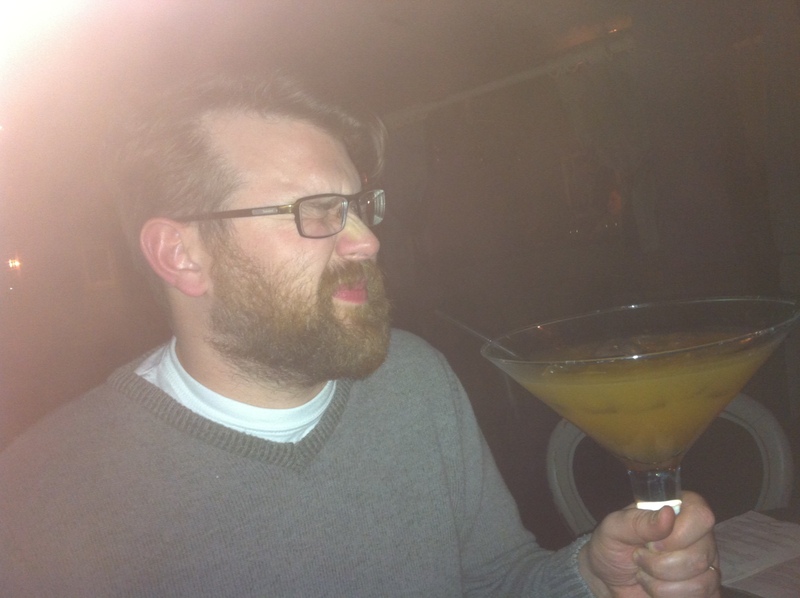 After a big meal I like to take a wee postprandial digestif‎, and so I recommend the Gustav Holst. Sorry ladies – I’m spoken for.